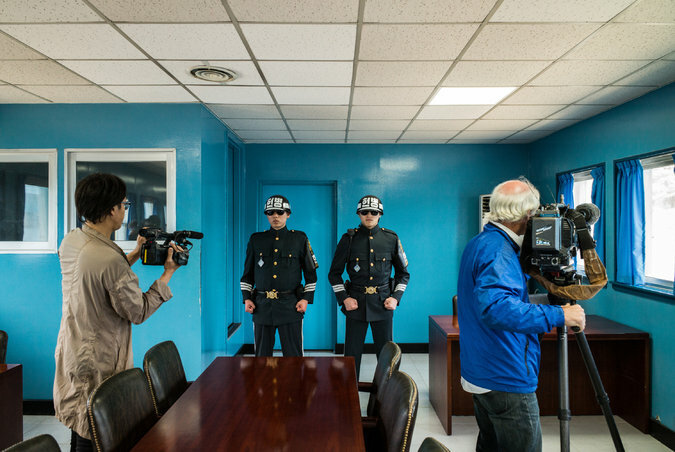 Created in the wake of the 1953 agreement as a place for negotiation and discussion, the space was established as the one place in the DMZ where soldiers and officials could come face-to-face. The United Nations Command administers the site. Soldiers patrol the plaza, which is flanked by two looming buildings: The Freedom House on the South’s side and Panmon Hall on the northern side. But at the center, six squat buildings actually straddle the demarcation line. Three are painted the powder blue of the United Nations. Inside the conference room that straddles the North-South border in the truce village of Panmunjom. It is inside these conference buildings — where the United Nations Command has facilitated peace talks over the years — that visitors can walk freely across the border. This all happens under the watchful eyes of stone-faced guards. Outside, a low cement slab between the buildings marks the border that soldiers, and visiting tourists, dare not cross. Those who come to the South Korean side stand back and gaze with curiosity across the plaza to catch a glimpse of their reclusive neighbors to the north. The North Korean who defected this week raced in a vehicle toward the demarcation line in the Joint Security Area around 3:15 p.m. Monday, according to South Korean military officials. His car became stuck on the north side of the border, the officials said on Tuesday at a news conference, and he jumped out and ran toward the South. That’s when four North Korean soldiers chased him and opened fire. The defector made it across the border, taking shelter near a building. He had been shot and wounded several times before South Korean and American forces found him 55 yards south of the demarcation line and dragged him to safety. He was then taken to a hospital, where he was in critical condition on Tuesday, South Korea’s state-run news outlet Yonhap reported. Until Monday, no North Korean defector had crossed the demarcation line in the Joint Security Area since 2007. It’s not the first time the truce village at Panmunjom has been rattled by violence. In 1984, a Soviet tour guide from the northern side of the border dashed across the demarcation line, with 30 members of the North Korean military at his back. The troops exchanged fire with South Korean soldiers in the Joint Security Area, killing one and wounding two others, but the defector escaped uninjured. In 1976, North Korean soldiers wielding axes shocked the world when they attacked and killed two American soldiers in the Joint Security Area. That episode changed the way soldiers move about this zone. Before the attack, they could cross over the demarcation line, but since the ax attack, each opposing forces must remain on its own side.